It's almost cliche by now, Mr. Bush's adamant refusal to play what he calls the Blame Game. Or at least to be on the receiving end of the Blame Game. If he wins the coin toss, I've noticed that he doesn't mind playing the Blame Game at all; he rather relishes it, in fact. He calls in the cheerleading squad and the team mascot and pats everybody on the fanny. Today he lost though. The fingers were pointing at him: Mr. Bush apparently authorized that leak we've been hearing about for so long. That classified leak. That Plame Blame Game, which could become a Dr. Seuss classic if Dr. Seuss were still alive and if he switched from writing about Star-Bellied Sneetches to writing about, say, Scooter Libby, who probably doesn't have a star on his belly. Or if he does, I don't want to know. But we're not here to play the Blame Game, mostly because it's already been blogged to death already today. 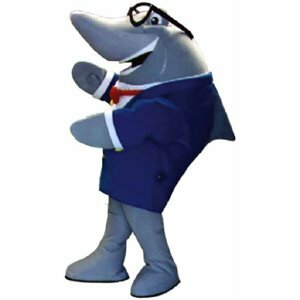 It does, however, put one in a mind of things American: classified information, jello, smirky guys in suits, shark mascots, and that sticky little Made in America sticker that you just can't pick off of a Made in America product, no matter how hard you try. There's always lingering gluey residue. And it's always somewhere conspicuous, ruining the flawless collectibility of your Franklin Mint Princess Di Vinyl Doll - Navy Dress Limited Edition. I'm certain there's going to be one of these stickers on every item in the catalog I got in the mail today. The catalog's called American Made and it's produced by the fine folks who've brought you the Reader's Digest, the magazine more old people have in their bathrooms than any other. So not only does this catalog claim that every product in it is made in America, but it also tells you what state the product is from. Actually, each product has an icon in the shape of its home state beside it. This icon reveals more than where the product is from: it also tells you a little something about the quality of your geography education. Who'd have thunk that I wouldn't be able to tell the difference between Illinois and a hideous birthmark? India has its curry, Hungary has its paprika, and the USA has its twin pillars of essential seasoning- Salt and Pepper. 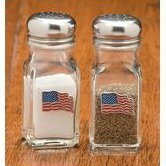 Our glass diner-style shakers sport American flags handcrafted of solid pewter and hand-painted enamel. Stainless-steel screw tops. Made in Delavan, Wisconsin. Salt and pepper. They're what make American cuisine so distinctive. And I'm betting my bottom dollar that the actual shakers are made in China, and just the pewter medallions are made in Wisconsin. Hand-glued to the shakers by inmates, no doubt. Only the unique shape of this candy bar will remind you of a potato! One bite reveals a light cocoa flavored marshmallow center drenched in a dark chocolate coating, then sprinkled with coconut. Made in Boise, Idaho since 1918. 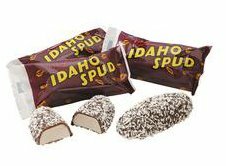 You get a box of 24 individually wrapped Idaho Spud bars, the state's best-selling candy bar. Unlike salt and pepper, those twin pillars of essential seasoning, Idaho Spuds really do reflect our national character. The rendering industry around Rochester, New York is responsible for two critical food technologies: Marshmallows and gelatin. The coconut, however, is a bit suspect, like Scooter Libby and his masters. Has the mail come? You could know for sure without taking that long walk. 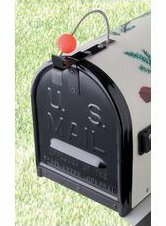 As soon as your mail-box is opened, a brightly colored ball springs up. Installs easily in minutes. 8"H. Made in Peru, Indiana. Can you picture it? The mailman, probably a Charles Bukowski kind of guy, hungover, with a heavy sack of mail slung over his shoulder, gets bopped on the nose by a brightly colored ball from Peru, Indiana. Will he be happy? No. Will you ever see your magazines again? No. Do you deserve to? No. C'mon. If you can peer out of your mostly-closed curtains and see the brightly colored ball, you can walk the 17 steps out to the damned mailbox. How hard is it? You know the mailman's been there -- you've been watching out the front window all day and your cockapoo started barking his fool head off when the mailman was still a block away. I can't decide which of these is the most embarrassing: that salt and pepper are our national seasonings; that people afix springy balls to the tops of their mailboxes, that people dress up like sharks who have dressed up like people, or that we have a president who cites national security when it's in his interest, and compromises it when it's not. The Idaho Spuds I'm not embarrassed by: I'm ordering a case of those.